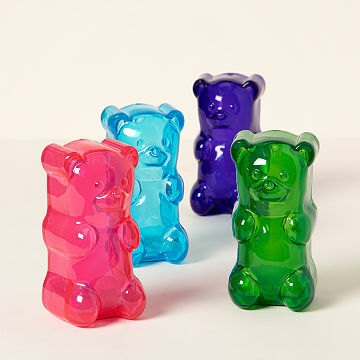 These cute, LED light-up bears will brighten up any space with a squeeze of their gummy bellies. Here's a home accessory so delectably adorable you'll be glad that you can't eat him! During the day, this cute, rubbery bear will take the boredom out of any room and at night, with a squeeze of his belly, a built-in LED light will provide sweet splashes of ambient colored light. Designed in Brooklyn. Made in China. To charge, please use 2 AA batteries, not included, either regular or generic re-chargeable ones. Light can also be powered by a 6 volt DC adapter, not included. The timer switch on the base has two functions: a one-hour automatic timer an infinite timer that will remain on unless it's squeezed off. The only auto shut on/off is the squeeze function. It appears that my Gummy Bear has died after 8 years (pretty good run). I have/had the yellow colored Bear. Is there a chance that this color will be reproduced? My kids sleep with them every night. I'm currently purchasing one for my 4 year old niece. I love the option for the sleep-timer vs "on all the time". I keep them on sleep timer and let my kids turn them on as they need it. It was their favorite gift at Christmas! It beat out Spider-Man and Frozen!! Highly recommend!! Bought for my niece for Christmas, they loved these, age 3 and 4. This item is being used by my niece in her bedroom. Very unique and cute. My 3 year old son loves it. He doesn't use it as a night light. He just loves to have it around and play with it; light up the hallway, etc. This light is the best! Whimsical and yet a cool, modern product.